New national survey shows 62% of school-age children and 85% of pregnant women have low iodine intakes. Israel's Health Ministry conducted the first national iodine survey, which revealed a high burden of iodine deficiency among Israelis. Iodine deficiency poses a high risk of maternal and fetal hypothyroidism, as well as impaired neurological development of the fetus. The International Child Development Steering Group has identified iodine deficiency (ID) as a key global risk factor for impaired child development, and the World Health Organization’s recommends routine monitoring of population-based data on urinary iodine every five years as a means of sustainable elimination of ID. Yet Israel is among the few countries that have never performed a national iodine survey, and does not provide iodine prophylaxis, even though some of its population has suffered from ID in the past. Israel similarly lacks current data on the incidence and prevalence of thyroid disease. Now, researchers from the Hebrew University of Jerusalem, and their colleagues at Maccabi Healthcare Services, Ashkelon's Barzilai University Medical Center in Ashkelon, and Switzerland's ETH Zurich, with support of the Iodine Global Network have obtained the first nationally representative data about iodine status in the Israeli population. To do this, the team collected pre-discard spot-urine samples, from 1,023 school-age children and 1,074 pregnant women, representing all regions and major sectors in Israel (Arab, Jewish secular and haredi), during 2016 at the Maccabi Healthcare Services (MHS) central laboratory. The researchers found a high burden of iodine deficiency in the general population: 62% of school-age children and 85% of pregnant women fall below the WHO’s adequacy range. The median urinary iodine concentration (UIC) among Israel’s pregnant women was only 61 micrograms iodine/liter, and for school-age children the median was 83 micrograms/liter. These numbers suggest the iodine status in Israel is among the lowest in the world. Iodine adequacy is defined by the WHO as a population median of 150-249 micrograms/liter for pregnant women and 100-199 micrograms/liter for school-age children. Virtually no differences were seen between different ethnicities and regions of the country, suggesting that low iodine status is widespread and universal throughout the country. Adequate iodine intake is essential for thyroid function and human health throughout life. Even mild iodine deficiency might prevent children from attaining their full intellectual potential, and mild to moderate ID has been linked with decreased cognitive performance. Iodine deficiency in utero and in early childhood impairs brain development, and severe iodine deficiency causes cretinism (physical malformation, dwarfism and mental retardation) and goiter (the enlargement of the thyroid gland). According to the researchers, the high burden of iodine insufficiency in Israel is a serious public health and clinical concern. Compared to data from other countries with a similar extent of deficiency, these data suggest that there is a high risk of maternal and fetal hypothyroidism and impaired neurological development of the fetus in Israel. “The immediate implication of our findings is that we need to improve the public’s intake of iodine,” said Prof. Aron Troen, who serves as Principal Investigator at the Nutrition and Brain Health Laboratory, School of Nutrition Science, and Hebrew University’s Faculty of Agriculture, Food and Environment. “It seems that as in most other countries, Israel’s food supply and our collective dietary habits do not ensure iodine sufficiency. Until now, isolated but persistent calls to address this issue have not translated to action, perhaps due to lack of awareness, or the unfounded but widespread belief that Israel's proximity to the sea likely prevents ID, leading to a corresponding lack of political will. However, in the absence of a universal salt iodization program, and in light of the heavy national reliance on iodine-depleted desalinated seawater as drinking and irrigating water, the study’s results point to a major national public health problem. According to the researchers, a universal salt iodization and monitoring program should be urgently initiated. 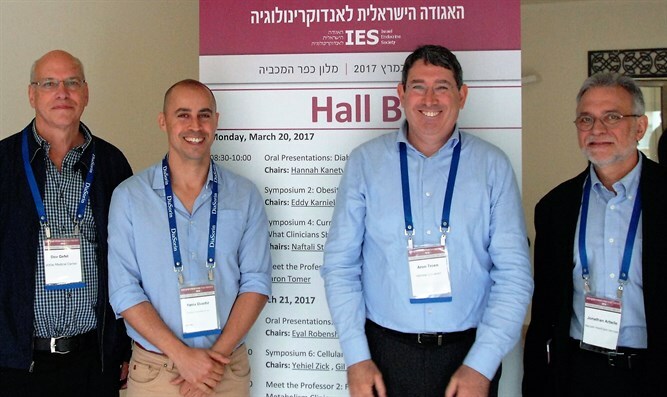 Lead co-researcher from Maccabi Healthcare Service Dr. Jonathan Arbelle called upon the Israel Endocrine Society to develop guidelines for clinical practitioners who care for pregnant and lactating women. “Caregivers should recommend adequate iodine intake during pregnancy and lactation, and a randomized clinical trial of risk and benefit for correction of mild-moderate iodine deficiency during pregnancy must be considered,” said Dr. Arbelle. “A healthful diet is a foundation of a prosperous nation. The public has a right, and government has both a moral obligation and clear-cut social and economic incentive to ensure that the nation’s food supply supports the public’s health, well-being and productivity,” said Prof. Troen. Doctoral student and registered dietitian Yaniv Ovadia, who performed the study, said, “Individuals can improve their iodine status through increased consumption of iodine-rich foods such as milk, dairy and salt water fish. They can also replace regular table salt with iodized salt. “Government action is needed to ensure that everyone has access to iodized salt. Only a small fraction of the salt sold in Israel is iodized, and it is sold at a much higher price than regular salt, although it does not need to be. The World Health Organization and Iodine Global Network encourage mandatory, universal salt iodization, including the all discretionary household salt. However, some countries have effectively been able to increase their iodine intakes through the use of iodized salt in processed foods, including bread and condiments, and this may be considered in Israel. These findings also highlight the critical need for routine public health surveillance, not only of iodine, but also of other nutritional and environmental exposures that determine the Israeli population’s collective health.